Extreme Broadband Engineering's exclusive Infinity Premise System™ is more than just products – it's an entire philosophy encompassing consulting, system solutions, product implementation, training and support. We're here for you, from the very beginning to infinity and beyond! Jumpers and connectors insert points of failure into a system, cost additional money, and waste installation time. Modules are uniquely designed to eliminate jumpers by providing a direct connection using the FIC Port. A variety of modules specifically designed to decrease installation time and increase reliability. Stop using jumpers and start using modules. Data Plus Amplifiers include unique design features to increase reliability and decrease installation time. The patented Blue Port/Blue Label marks the passive data port. By utilizing a passive data port on the amplifier, modem/VoIP service will not be interrupted in the event of power loss. Additional outputs remain active and increase dB levels by a specified gain. Dual LED status lights, small compact design, and True Flex housing are just a few features assisting the technician in every installation. Not to mention, superior engineering. Bi-Directional amplifiers provide gain in both the forward and reverse. The IPA1008D-RSVF is a unity gain Data Plus amplifier. Uniquely designed to overcome the splitter loss in the forward and reverse, the unity gain amplifier provides 0dB gain in both directions providing a more simple installation. *Also available with data stabilization option, Model IPA1008DS-RSVF. The IPA1044D-RSVF, Data Plus amplifier, provides 4 dB gain in the forward and 4dB gain in the reverse in a small compact housing. *Also available with data stabilization option, Model IPA1044DS-RSVF. The IPA1111D Data Plus amplifier, provides 11 dB gain in the forward and 11dB gain in the reverse in a small compact housing. *Also available with data stabilization option, Model IPA1111DSL-RSVF. Forward amplifiers provide gain in the forward only, offering a passive return. The IPA1008D-VF is a 0dB gain Data Plus amplifier with a passive return. *Also available with data stabilization option, Model IPA1008DS-VF. The IPA1044D-VF is a 4dB gain Data Plus amplifier with a passive return. *Also available with data stabilization option, Model IPA1044DS-VF. The IPA1111D is an 11dB gain Data Plus amplifier with a passive return. *Also available with data stabilization option, Model IPA1111DS. 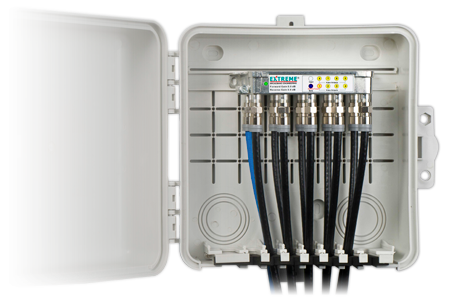 Broadband digital splitters are designed to meet the highest technical performance in the broadband industry. Trust your network with the Extreme Broadband Digital Splitter. Zinc die cast housing and fully soldered back ensure the best electrical performance in a variety of outputs. Precisely engineered electrical components and materials guarantee peak performance in every condition, location, and environment. Extreme Broadband Engineering has revolutionized premise enclosures. Designed with the technician in mind, the Infinity Premise Enclosures reduce installation time and have uniquely designed features to keep every enclosure installation neat and clean. Quick Mount Rails, Cable Retentions Slots, and Continuous Bosses are a few features that make the Infinity Premise Enclosure truly unique. The IPE963 is a 9x6x3 enclosure designed to increase usability and provide mounting flexibility. Includes all features. The IPE993 is a 9x9x3 enclosure designed to give added space for additional components. Includes all features. The IPE12123 is a 12x12x3 enclosure. Large enough to contain two (2) 8-Output amplifiers side by side and room for additional components, small enough to retain the low profile look. Includes all features with the addition of a Quick Mount Rail and half-moon conduit guides.